Docol Tube R8 are certified tubes that are engineered to provide a stronger, safer, more consistent alternative to 4130 CD seamless tube. This will allow you to build a faster, more consistent, longer lasting racecar that allows better utilization of tuning components. Docol Tube R8 undergoes special heat treatment in a continuous annealing line, producing a two-phase structure. Ferrite that imparts unique forming properties represents one phase, and martensite that accounts for the strength represents the other phase. Docol is not a standard High Strength Steel (HSS), therefore during application and design, it is imperative to contact A.E.D. for specific technical properties. Advanced High-Strength Steels (AHSS) are complex, sophisticated materials, with carefully selected chemical compositions and multiphase microstructures resulting from precisely controlled heating and cooling processes. The principal difference between conventional HSS and AHSS is their microstructure. Conventional HSS are single-phase ferritic steels with a potential for some pearlite in C-Mn steels. AHSS are primarily steels with a microstructure containing a phase other than ferrite, pearlite, or cementite. Advanced High-Strength Steels like Docol Tube R8 are not your mild steels of yesterday; rather they are uniquely engineered to meet the challenges of today's vehicles for stringent regulations, emissions reduction, and solid performance at affordable costs. Stronger than 4130 by 10 to 15 percent. Heat Affected Zone (HAZ) is Docol is much smaller in area, less brittle and retains better elongation than 4130 typically does. Docol is much more tolerant to heavy fabrication. It does not warp and distort like 4130 and stays more relaxed in tooling and fixtures during fabrication. Docol absorbs energy and presents a more consistent and controlled failure mode. Clean mill finish product - minimal, if any, surface prep required. Docol does not have an oxide or decarb layer and looks like a high quality electric welded tube. Accurate and consistent dimensional and mechanical properties because this material is a rolled and welded strip. Compatible with welding to 4130 and mild steel components. Suitable for TIG and MIG welding. Clean "no scrap" based material. As a seam-welded product, for best forming results, it is recommended to orient the seam in the neutral position. 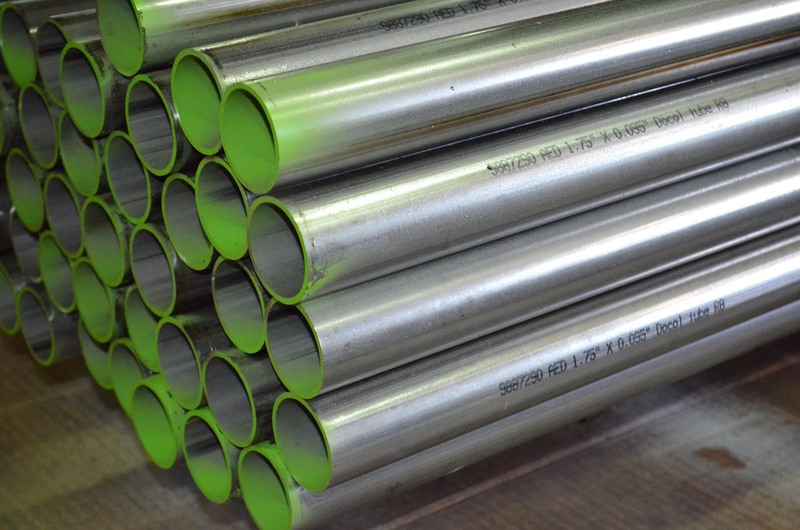 Welding recommendations: ER80SD2 filler material for both TIG and MIG welding. Docol as a finished tube is NOT heat treatable material. Any attempt to heat treat Docol may result in what is known as a "dead soft" material with minimal strength value. 116,000 psi 100,000 psi 13% +/- .006" +/- .005"